Then I was looking for backing or border fabric and I found some more brown fabric that I like. But I can't decide. Would this flower fabric be too busy? Just for 6" alternating blocks with the bear fabric? or do you think the flannel is better? Stepping out and saying that I like the brown flower fabric. It seems to echo the stars and the golden color mixes quite well. Both are very nice and work well together. Up to you now. 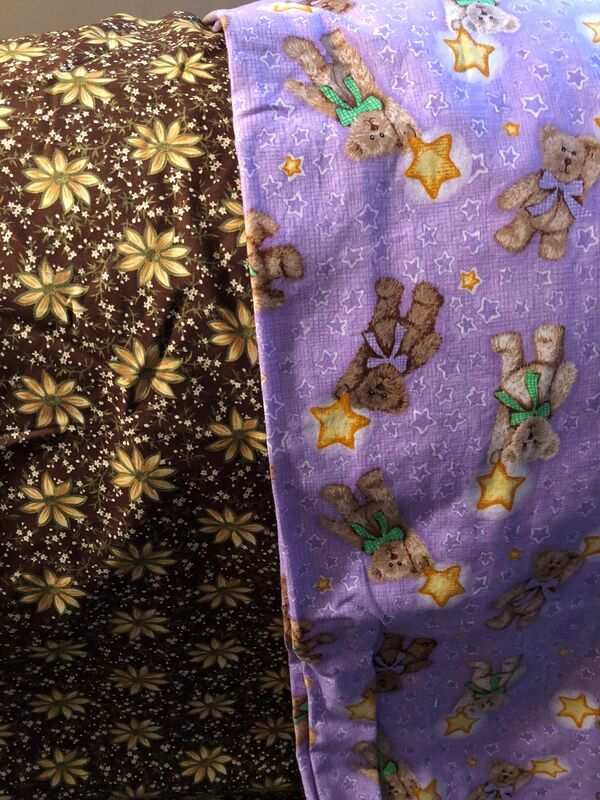 Oh, I like that brown fabric with the bears. I would pair them on the front and use the flannel for the backing. Instead of the brown, do you have anything the color of the bow on the bear? That would be cute. I really like the plaid. It seems so cozy. Of the two, definitely the plaid. The brown flower doesn’t seem to go with a baby print. I lije the idea of pairing the bow colors or even just the yellow, or alternate yellow and white. I really like the brown with the flowers. The plaid probably goes with the Boyd bears fabric. I like the plaid, especially if it’s for a boy. yes, i like the dark brown of the newer one. but either could still work. If this is for a boy, go with the brown plaid. There is a new trend... absolutely no flowers of any kind or color for boys!! I'm serious! 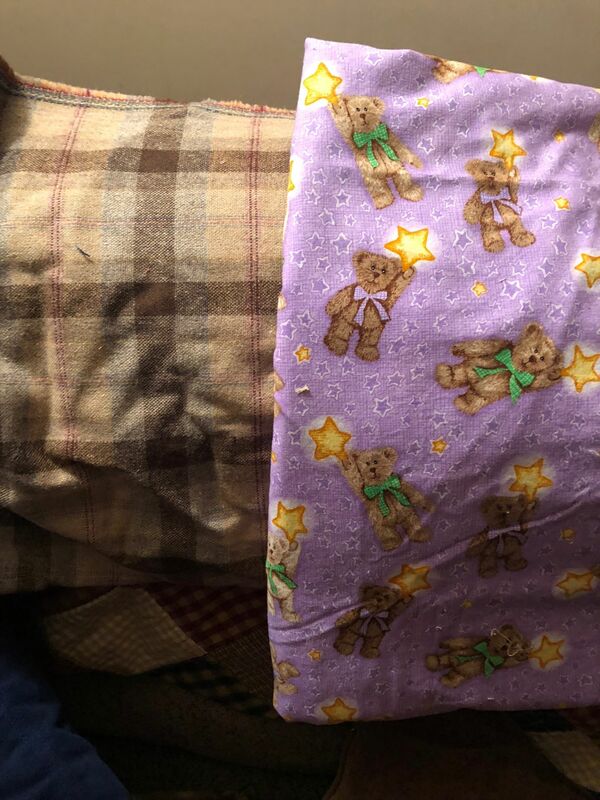 The center I donate all my baby quilts told me of the new "fashion rules" a couple of months ago. The boys' mothers are very adamant and will not accept them! Girls' mothers are not so picky, but prefer pink, light colors, and that lavender. Flowers are approved and all colors are acceptable. Don't ask why. No one seems to know. You can use whatever you want. however, I will echo what someone else said about finding one of the accent colors and using that. I think the floral or plaid will overpower. Plaid on back is cute. What are the fashion rules for the boy’s quilts? What do you mean that no color is used? Well, at least they aren’t taking quilts they won’t use. Me to. I like that combo. Definitely like the plaid used as the back. I don't care for the new brown piece at all. I think it competes with the bear fabric. 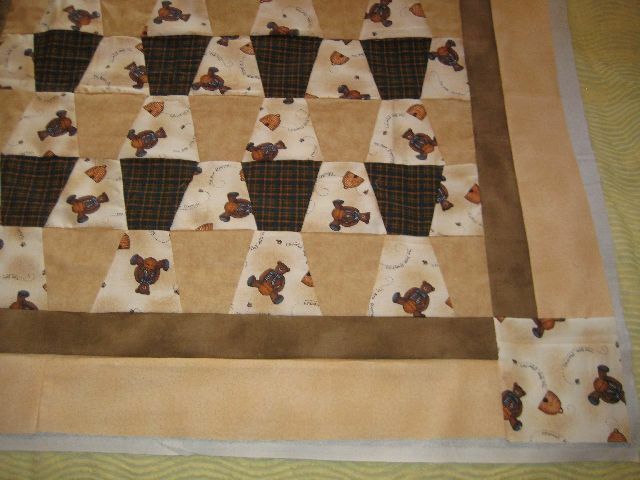 Yes, to the bow color or a tan or brown blender if you are needing an alternate block with the bear fabric. Especially if you stay to the tan or brown with this lavender, I think you can get away with this going to either a boy or girl. Cute fabric! I agree...I would be more inclined to think the flowers would be a better choice if it was for a baby girl. The CPC's are taking them all. The girls' mothers will take them if no others are available. The boys' mothers will take ones with blue, green, orange, red, brown, any dark colors, but no flowers! Remember, this may be a local problem and not a national or international one. I'm in the NC piedmont area. Last edited by SillySusan; 11-09-2018 at 03:53 AM. I think the plaid is more boyish. I like your first choice, the plaid, better. The powerful color of the flowers distracts from the bears, which is why you chose that fabric in the first place....to go with the bear you are giving. Just my opinion. If you are going to work from your stash only, I think the idea put forth in the first thread is still the best - whole cloth bears on the front, plaid on the back and the purple ruffle. I don't think either fabric works well for the alternate blocks pattern. My opinion is that to look good, an alternate block design would require a less busy fabric (grunge, tone on tone, etc.) that won't overpower the bears. Two other things to consider - You said you need to get it made because of the time frame and it's a gift for an underprivileged girl. Those folks may have never had an actual pieced quilt. They might appreciate the whole cloth quilt more than a pieced one. I'm sure she will love it, as it will match her teddy bear. She'll be using it to cover her teddy bear, snuggle up under and drag around the house. That's just my opinion, though. Other folks have expressed different ones. If you can't decide, either buy something you like better or just make a decision (try "Eeny, meeny, miny, moe") and resolve to be happy with it. This is a Christmas gift for a little girl, not another quilter. A quilt made for a friend using her fabrics and the tumbler die.